It took a month and a half into the season to get the first named storm in the Eastern Pacific, but this weekend we have two named storms. Blas is well away from land in the eastern Pacific. This system is expected to strengthen over the next few days, potentially into a major hurricane. Tropical Storm Blas formed well off the western coast of Mexico on Sunday and is expected to move west-northwestward over the next several days. Blas will likely become a hurricane by Monday, but is no threat to land. Blas was located more than 700 miles south-southwest of the southern tip of Baja, California, as of Sunday night, reports the Weather Channel. Blas is forecast to become a hurricane by Monday, and could become a major hurricane later this week (Category 3 or stronger). 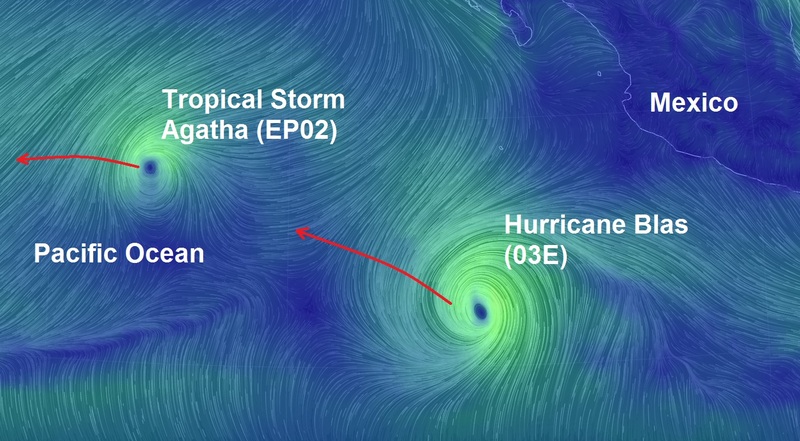 Agatha is no threat to land in the eastern Pacific. This system is forecast to weaken in the days ahead. Agatha developed Saturday morning, becoming the first named system in the Eastern Pacific this season. Agatha is not expected to directly affect any land areas in the immediate future as it heads west-northwest over the open Pacific waters.